So like I finally completed Mass Effect 2 and it's quite the game eh? But you already knew that didn't you? I tend to be very picky with my Xbox game purchases and will often only purchase a game well after the hype has died and the reviews and reflections of seasoned gamers are to be found. That was how I found the original Mass Effect and when the price was right, I snapped it up. After that Magnificent game, I don't know why I delayed getting ME2 for so long. It's a triumph of story telling, it's your own pick-a-path in space - knowing the choices I make for our hero Commander Sheppard have repercussions in game and in ME3 can make for a tortuous exercise at times! Knowing that I have a renegade Sheppard game saved for another run through meant I could generally keep a firm line - I usually chose a paragon action over the renegade but once in a while it was literally fun to stab someone in the back. The characters to be found in ME2 are almost larger than life. When you get passed the dullsville that is Jacob, the Krogan known as Grunt, and to a certain extent, Miranda, the Mass Effect universe is full of interesting characters. I really enjoyed chatting with Mordin Solus about the ethics of the genophage and Samara's views on vigilante justice. I was disappointed when I managed to let her die during the suicide mission - I won't let that happen on my second run though! I found the combat to be improved this time round, I don't know if was all my training with the sniper rifle in Halo: Reach or that they made it easier but this was my goto weapon for most encounters. I liked how ME2 made the whole weapons arrangement systems 'automatic' and you didn't have to mess around buying so much crap. Despite lots of complaints from people, I didn't mind the mining operation part of the game to fund weapon upgrades and the like. Sometimes a bit of toil can bring rewards and I figure doing all of that helped build to a successful suicide mission outcome (maybe further run throughs with different choices may render that idea redundant?). It was amusing to meet ME's original love, Ashely on a mission wherein she immediately got all mad at Sheppard for dying on her, not calling or whatever and basically threw a sulking tantrum only to apologise by an email later on. Does sleeping with Miranda after 'chat' that mean Sheppard cheated on Ashley? What repercussions if any will this have for Mass Effect 3? Either way, I stayed away from that Jack girl. She got crazy coming out her ears! I did appeciate how the choices made in ME1 had some influence on this new story. While I may have shot a certain grumpy Krogan because he bored me and let the Arachni Queen live simply because I like spiders, I was pleased to see these actions had relevance in ME2 - and also, seeing how the alien races in universe of ME are slowly banding together as a result of in game actions is a great example of game play and story telling. 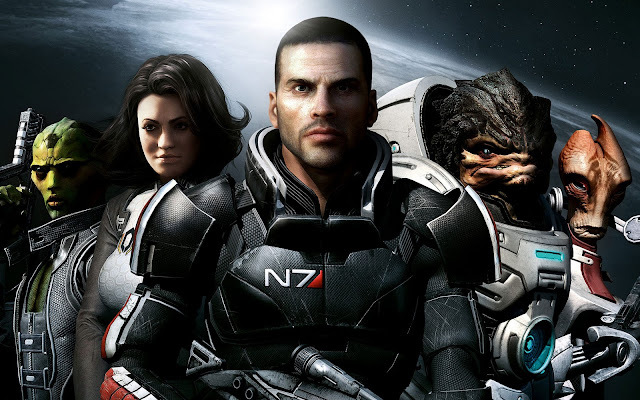 Overall I immensely enjoyed my first run through of Mass Effect, it as a mulitude of stories to tell, many aliens to shoot and the graphics and cut scenes were top notch. Bring on Sheppard saving Earth in ME3!